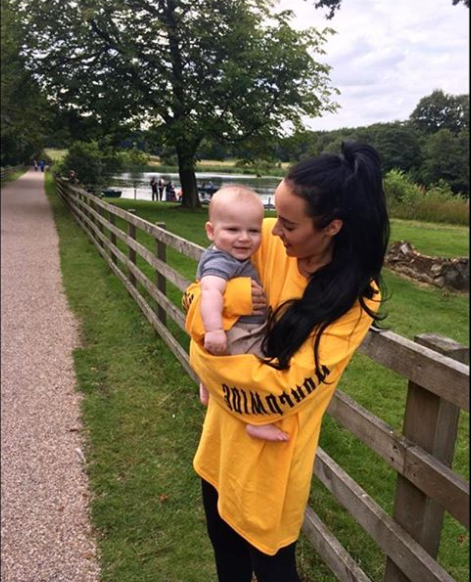 Stephanie Davis has had a tough week but she’s put it all behind her by enjoying the cutest day out with baby Caben. The actress took her seven-month-old son on a trip to the zoo over the weekend and posted a seriously adorable photo as they shared a cuddle at the venue. Steph, 24, holds a smiling Caben in her arms and looks at him lovingly in the snap. ?,’ the former Hollyoaks star captioned the picture. It comes just days after Steph’s ex-boyfriend Jeremy McConnell avoided jail after being found guilty of assaulting her at her home in March. Jeremy, 27, was given a suspended prison sentence as the judge ruled that he had ’27 years of previous good character’. A restraining order was also passed which means that the Irishman – who is the father of Steph’s son Caben – must stay away from Steph for three years. Steph didn’t attend court to see Jeremy given his sentence on Friday but a statement from her was read out during the hearing in which she said the attack had made her feel a ‘nervous wreck’. She hasn’t commented on her former boyfriend’s sentence but it’s been reported that she’s ‘devastated’ that Jeremy avoided jail. Steph also spoke just a few days ago of how she suffered a miscarriage last month which left her heartbroken. Following all of this stress fans are thrilled to see her and Caben looking so happy on their day out. ‘what a lovely photo of u both Canban is so handsome u are an amazing woman so brave & strong lots of love,’ one admirer commented on the post.